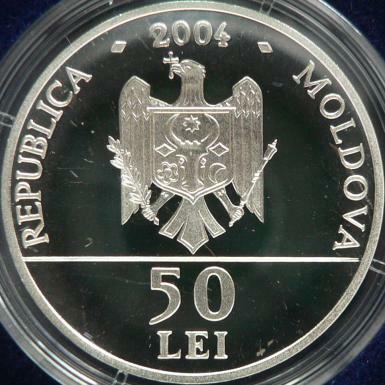 year 2004, circular inscription REPUBLICA MOLDOVA meaning "REPUBLIC OF MOLDAVIA" and the coat of arms of the Republic of Moldavia, in exergue denomination "50 LEI" metropolitan Dosoftei of Moldavia holding a bishop staff, inscription MIRTOPOLITUL DOSOFTEI·1642-1693 meaning "METROPOLITAN DOSOFTEI"
The coin was struck at the Czech Mint, having a mintage of 500 pieces. We are grateful to Mr Yu_L.Yan, that sent us pictures of this coin. The layman name of Dosoftei was Dimitrie Barila. He was a descendent of the Macedo-Romanian family Papară from Lviv (Lwow in Polish, Liov in Romanian). That means he descended from the most important strain of Aromanians - Romanians south of Danube - , indigenous to the famous ancient province of Macedonia. Monk at the Pobrata (today Probota, county of Iaşi) monastery in 1649, under the name Dositei, he became bishop of Huşi in 1658, bishop of Roman in 1660 and metropolitan of Moldavia in 1671. In 1686 John Sobieski, king of Poland, made a military expedition in Moldavia, and succeeded to occupy the city of Iaşi, capital of the country. 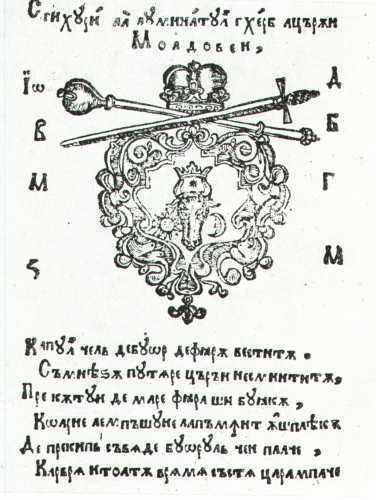 The Moldavian chronicler Ion Neculce wrote: "And then the king seized the metropolitan Dosoftei from Iaşi, with all the clothes and the jewels of the Metropolitan. And he took the relics of Saint John the New from Suceava...". Neculce said: "This Dosoftei metropolitan was of his sort not a simple man. He was from a small boyar family; too learned, he knew many languages: Hellenic, Latin, Old Church Slavonic and other deep knowledge and studies, perfect monk and devouted, and gentle as a lamb. In this country nowadays there is no man like that". Dosoftei died in December 1693 in Poland at Strij (Stryj in Polish), being buried at the Zolkiev monastery. Dosoftei was one of the greatest personalities of the Eastern Orthodox Church. 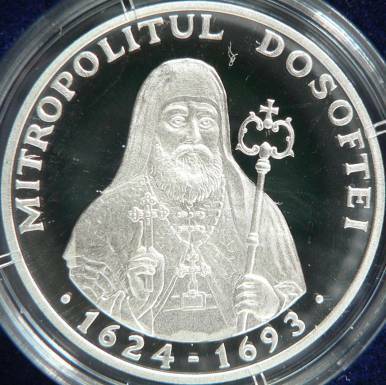 The Holy Synod of the Romanian Orthodox Church canonized Dosoftei on October 14th 2005. 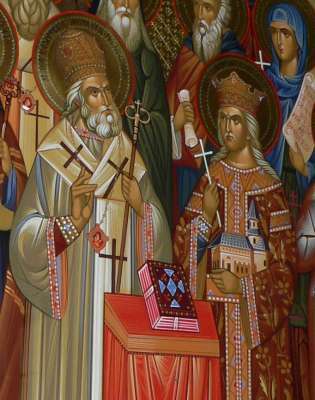 Saint Hierarch Dosoftei is celebrated on 13th of December. In 1673 he published in the Polish small town Uniev "Psalmbook Drew Up in Verses", his main creation, the first large work written in verses in Romanian. This psalmbook in verses was made after the model of the psalmbook written by the great Polish poet Jan Kochanowski (1530-1584). 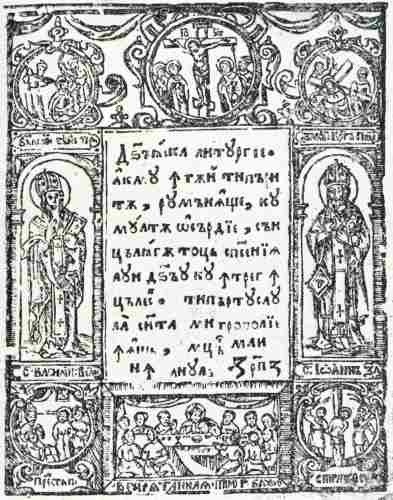 Dosoftei re-established the printing shop of Iaşi, here being published "Dumnezăiasca liturghie" (Godly Liturgy, in 1679, followed in 1683 by the second, completed, edition), "Psaltirea de-nţeles" (Psalmbook for Understanding, or Slavic-Romanian Psalmbook, 1680), "Viaţa şi petrecerea sfinţilor" (Life and Passing of Saints, 4 volumes, 1682-1686), and many other religious books. 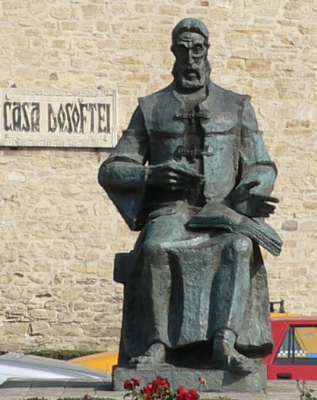 Dosoftei work - both translations or original writings - represented a strong impulse for the Romanian culture. în anul 7187. // in the year 7187. Coarnele-n păşune la pămînt îş pleacă. C-ar vrea-n toată vremea să stea ţara-n pace. Means the country's unfaltering power. The horns at pasture to the ground it bows. That at all times the country at peace to rest.